Lafont glasses, hoop earrings from H&M Japan, Hawaiian dress 'Made expressly for The Holiday Shops by Tori Richard Honolulu' (and found in an op shop! ), Ken Done purse, vintage jewellery, silver cuff by Iain, Elen Wagner shoes. 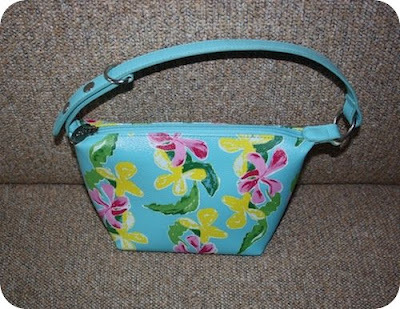 I found this Ken Done purse in a Mornington op shop late last year. It was in the children's section which I think says something about the fashion trend of HUGE bags for women. But the wee little bag will do me just fine for the basics of the day (like money for a coffee!). Beautiful in Blue. Great finds. I too wish all our friends in Qld. a safe and dry week.